Working with compliance with TCPA is murky and fraught. Technology options exist can help with TCPA compliance - but none are without some risks. 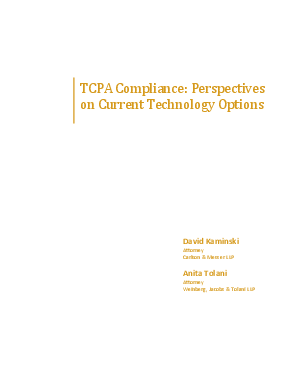 In this white paper series, on TCPA, from ARM.com, Latitude Software, and Interactive Intelligence, we asked collection industry attorneys David Kaminski and Anita Tolani to weight in on different aspects of technology for TCPA compliance.